I am a Friends addict. I am not talking about my real-life buddies (I love you all, but that is not today’s subject). I am talking about the best sitcom to ever be on television. I am sure not everyone agrees with me, but it is my blog so I can say things like that! I never get sick of Friends. I have every episode, and that is usually what is hanging out in my DVD player. I can pretty much relate any situation back to a Friends episode. Stick around and I will prove this theory by somehow relating all of this back to a baked potato. I love all of the Thanksgiving episodes. My favorite was probably in Season 6 when Rachel tries to make the Thanksgiving dessert. Everyone is a little nervous about her taking on such a big responsibility but she had confidence in herself…..
Rachel: Monica said I could make dessert this year! Joey: Uh-you're going to...cook something? Chandler: Offering people gum is not cooking. Phoebe: Are you sure Monica said you could make something this year? Because I remember her saying in two years. (to Monica) You said in two years right? Monica: (a little hesitant now) No...I...I promised her. But uh Rach...are you sure you didn't want to start out something as big as Thanksgiving dinner? I mean maybe...you wanna try a little Thanksgiving breakfast....maybe Thanksgiving snack? Rachel: What? You guys I could do this. Remember I made those peanut butter cookies? Rachel: I don't know what you guys are so worried about. Cooking is easy. You just follow the recipe. If it says boil two cups of salt, you boil two cups of salt. I laugh every single time I see that scene. Even writing it out makes me laugh! Hilarious. Is there anything easier than a baked potato?? Even Rachel can make it. There are so many ways to dress it up. This fajita potato was quick, easy, and yummy. A perfect weeknight meal. The perfectly cooked potato is topped with shredded cheese, chicken (I used store-bought rotisserie), fajita peppers and onions, and a spicy adobo sauce. The adobo sauce is made with fat free Greek yogurt and chipotle peppers in adobo sauce. You can find these in the canned goods near the taco fixings. They are really spicy so start with a little and add more to your taste. The Perfect Pairing for this recipe is the never fail method I use to bake perfect potatoes. The end result is crispy skin on the outside and perfect potato goodness on the inside. Here is what you do…. Wash and dry the potatoes, prick with a fork 5 to 8 times to release steam, toss in a bowl with canola or vegetable oil until they have a light coating, sprinkle with kosher salt, bake in the oven (directly on the rack) at 350 degrees for about 1 hour or until the skin is crispy and the center of the potato is soft when tested with a sharp knife. If you need to hurry the process along you can nuke the potatoes for a couple of minutes before you bake them, but don’t have them in the microwave for too long. Preheat the oven to 350 degrees F. Wash and dry the potatoes. Pierce each potato about 5 to 8 times with a fork. Toss the potatoes with canola or vegetable oil in a large bowl until they have a light coating of oil. Sprinkle with kosher salt. Place the potatoes directly on the oven rack. Bake for 1 hour, or until the skin is crisp and the potato is soft when tested with a knife. Meanwhile, in a large skillet, heat the olive oil over medium heat. Add the sliced onion and peppers. Sauté until tender and browned. Add the fajita seasoning, water, and lime juice. Sauté until the liquid has absorbed, stirring occasionally. In a small bowl, combine the yogurt, adobo sauce, chopped adobo pepper, and lime juice. Stir to combine. Taste for seasoning and salt appropriately. You can add more adobo sauce if you like it extra spicy. 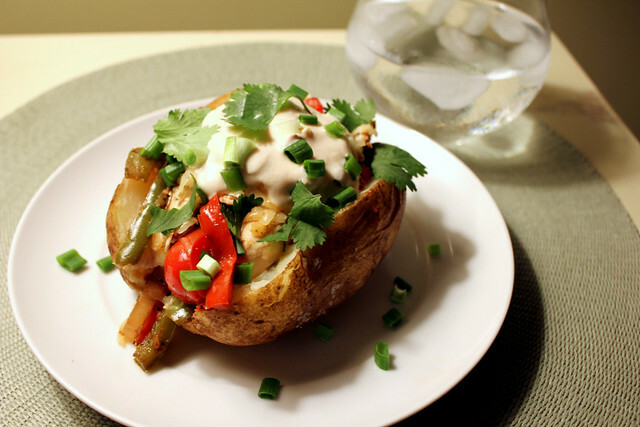 To serve, cut a baked potato down the center and top with the shredded cheese, chicken, pepper mixture, green onions, cilantro, and adobo sauce. I just tried to post, but I guess it didn't go through... I apologize if I comment twice! This recipe looks so yummy! I plan to add mushrooms to it also! Yum! Your pictures are so beautiful! How do you get such wonderful lighting in the evening? Whenever I try and take pictures of my dinners they end up being dark and awful! Thank you for the compliment! I seriously struggle with photography, so I appreciate that. At night I take the pictures with only the light of a lamp and no flash. I would like to get some lamps with "daylight" bulbs... still working on that!